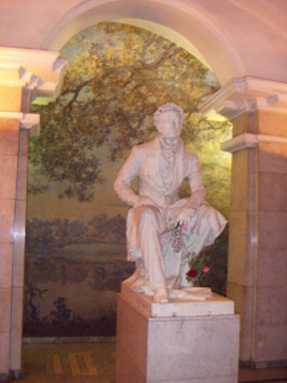 Saint Petersburg Metro is an underground rapid transit system in Saint Petersburg, Russia. Formerly known as Leningrad Metro, the system exhibits many typical Soviet designs and features exquisite decorations and artwork making it one of the most attractive and elegant metros in the world. Due to the city's unique geology, the Saint Petersburg Metro is the deepest subway system in the world. Serving nearly three million passengers daily, it is also the 16th busiest subway system in the world. 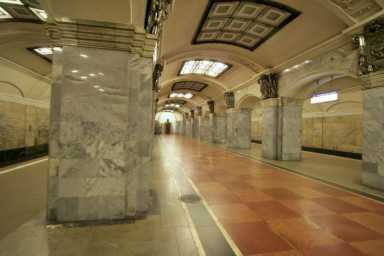 Some of the features of the Saint Petersburg Metro make it stand out amongst others, even those in the ex-USSR. It is customary to have all stations in the centre of a city to be built very deep, not only to minimize disruption, but also, because of the Cold War threat, they were built to double as bomb shelters (and many old stations do feature provisions such as blast doors and air filters). However, in most cities, as the lines reach the outer residential massifs, the lines become shallow (and in some cases even surface). However, in Saint Petersburg this is not the case. The difficult geology means that of the 60 stations 53 are deep level. The design and architecture went through numerous phases. The original stations were predominantly pylon type of which there are 13 stations. Also popular was the column layout, and there are 14 such stations in the system. The first stage is exquisitely decorated in the Stalinist Architecture, but already from 1958, Nikita Khruschev's struggle with decorative extras restricted the vivid decorations to simple aestatic themes. 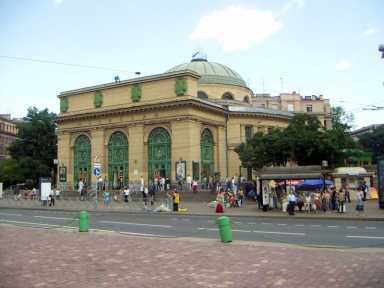 During this time a new design called "horizontal lift", which is a variation of a station with Platform screen doors, that has not been found elsewhere outside Saint Petersburg became widespread and 10 stations were built with this layout. However the design became unpopular with passengers and other technical reasons, and in 1972 the last station was built and none since. 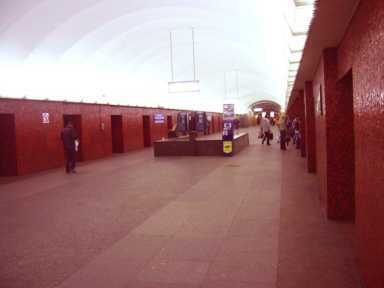 From the mid-1970s a new open "single-vault" design was developed by the local engineers and became very popular, not only in Saint Petersburg, but some other cities as well, known technically as Leningradky Odnosvod to this day it became the most popular of all and there are 16 such stations in the city. The remaining stations are located virtually on the edge of the city, and one, Devyatkino, is territorially in the Leningrad Oblast, far away from the harsh underground geology that forms the Neva Delta. The three shallow column stations that are located in the southwestern section of the city and are all on the Kirovsko-Vyborgskaya Line. The first one, Avtovo is considered to be one of the most beautiful stations in the world and was opened as part of the first stage in 1955, the other two were built in late 1970s to a typical Moscow-style pillar trispan design. In addition there are four stations that are on the surface, all termini and are all located prior to the lines' connection with the train depots. The city's northern climate means that even here all of the station space is inside an enclosed structure.